My Retail Journey: Multiplex & Movies - Convenience or Complex? It’s been a week since the Maharashtra Government passed a mandate that Cinema goers can bring their own snacks / food items and that the Multiplex owners cannot stop them from consuming the same. The response to this from various sections of the ecosystem has been mixed. While a section of film viewers is excited that they can carry their preferred snacks inside the theatres, another set of patrons are quite upset, so much so that there has been much disdain about this on social media. Some have compared the expected outcome to that of train journeys where passengers would bring parathas and Idlis and how the whole cabin would smell (or stink) of various Indian spices, especially. On the other hand, Multiplex owners are clearly unhappy. They would be losing a majority of their revenues, estimated at approximately 30% of their Turnover. This would hurt their business economics and may even make a few screens unviable, especially inside Malls where the real estate costs are significantly higher. To give a background, there were about 12,000 standalone screens and less than 50 multiplex screens a decade back. As I write this article, there are an estimated 2,000 multiplex screens (Screens inside a multiplex & not just the number of Multiplexes) while over 4,000 standalone theatres have shut down, unable to cope with the latest improvements in technology, leading to lower patronage of users, and subsequently inability to maintain the screens. Due to heavy investments, Indian entertainment companies are adding no more than 150 screens pa while International players like Cineapolis couldn’t cope with the spiralling costs, which are never offset with premium services such as push back seats, exclusive box areas and so on. In comparison, the US has 40,000 screens and China, about 24,000. In the same tune, the Box Office Market in the US is about $10 billion pa, $5 billion pa in China and about $3.5 Billion in India. The average ticket price in the US is about $8, $5.5 in China while India is at a distant $2. India makes about 2,000 films pa, 60% of which are from rest of India while 40% is in just one language - Hindi, which has a national appeal. From Amitabh to Shah Rukh, Rekha to Deepika, Hindi film stars have always been able to captivate the imagination of a majority of Indians, undoubtedly. Then there are regional stalwarts in almost every State of India who command record salaries as well as have magnificent BO openings when their films release. Despite all of this, the average time for a new movie to have a pirated version available online is under 12 hours. The July 9 release Kaala feat. Superstar Rajinikanth had its pirated version available by 8 am, even as the film only released in Singapore and Malaysia the previous night. Online activists are quick to bring down the ratings of a film with Video reviews published on YouTube which further minimises the potential of the film even during the first weekend. Interestingly, many films which had lukewarm opening have been able to boost theatre viewership through similar online reviews, positive ones of course, sometimes even rigged/paid. The Multiplex culture started expanding when a standalone theatre by the name Priya Cinema in Vasant Vihar area of Delhi set up multiple screens at Malls with its international partner Village Roadshow, which subsequently became to be known as PVR Cinemas. Today, it’s a public limited company having over Rs. 800 Crores in Turnover and has a number of innovations to its credit and is the most preferred Multiplex chain in India with a presence spanning Chandigarh to Chennai, Baroda to Calcutta. An estimated 800 malls of various sizes ranging from 1.5 lakh sft to 1 million sft came up during the peak period of India’s Retail explosion between 2006 - 2014. Therefore, almost every Mall had to have a Multiplex with a minimum of 3 screens up to 12 screens in some cases. Due to high operating costs (mostly rental & maintenance), Multiplexes pegged their ticket prices higher thank standalone theatres. In some states like Tamil Nadu and Andhra Pradesh, the Government had a cap on ticket prices which added further strain on their viability. Therefore, most Multiplexes took to enhancing the experience with culinary delights with flavoured pop-corn, designer ice-cream varieties, gourmet food and so on. Therefore, a Samosa could cost between Rs. 40 – 80 per piece (Rs. 20-25 in the city) depending on which city/Mall one was consuming. A portion of Pop Corn came at 100 with higher prices for exotic flavours. There were times when consumers preferred to visit cinema halls just for dining & recreation than watching films. And Multiplex owners weren’t complaining one bit. Until recently, perhaps 2 years ago when ardent film goers and the public at large felt that the food and beverage costs were so high, that for a family of 3 or 4, the cost of dining was 2 to 3 times the cost of tickets per person, putting heavy pressure especially on middle class families. This led to a lot of offline discussions and online debates, arguments with theatre staff and fist fights at public spaces, making the entire process of watching films at cinema theatres an expensive and an uninviting affair. With the economy slowing since 2016, Demonitisation impact, GST on Cinema Tickets and overall uncertainties galore, (The BJP Government thinks otherwise, though) piracy at unprecedented levels with nothing being done by the Government or Producers or the Film fraternity, the footfalls to Multiplexes started decreasing steadily. So much so, that as recent as Jan-Mar 2018, the average occupancy at Multiplexes has been less than 40% on weekdays and close to 75% on weekends. Except for a few mega hits (across languages), the overall Box Office earnings haven’t been one bit rosy. This has created a huge pressure on Multiplex chains with their dependence on F&B much more today than before. 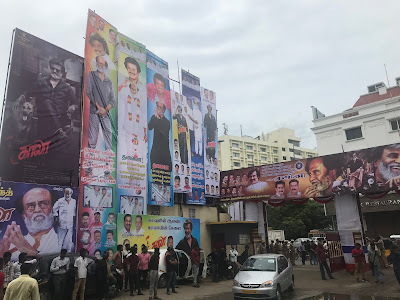 I have been organising full shows for the first weekend of every Rajinikanth movie for the past 11 years. I book an entire screen (approx. 220 seats) and distribute the tickets at face value to friends and friends of friends. Over the years, it’s almost been a custom now and many people look forward to the entire experience. I would usually organise one show on a Saturday morning of the opening weekend but due to unprecedented Marketing efforts and expectations galore, I organised 3 shows for the 2017 blockbuster Kabali feat. Superstar Rajinikanth. Similarly, I approached the Multiplex chain (am withholding the name for personal reasons) for the 2018 release Kaala but I was in for a shock this time. The ticket price had already been officially hiked by the Tamil Nadu Government and capped at Rs. 205 (in Chennai); add to this, a compulsory F&B Combo of Pop Corn & Coke for another Rs. 195, taking a single ticket cost to Rs. 400! Forget convincing 200 people, I was not ready to pay such a figure for my own family of six. So, I preferred to watch in standalone theatres, although I watched the film thrice within the first 10 days of its release. The film bombed at the BO and there has been much disappointment among Producers, Distributors & Exhibitors. Sanju, feat. Ranbir Kapoor, a film which was the official biopic of Actor Sanjay Dutt has apparently grossed Rs. 500 Crores at the BO in India and abroad, which is a saving grace to the Industry. Amitabh Bachhan starrer “102 not out” was off the screens in less than 2 weeks and is already available on Amazon Prime. Talking of OTTs, there has been an aggressive push by Netflix, Amazon, Hotstar and others with buying exclusive rights from the Producers even before theatrical rights are sold. With lowering data costs (for handheld devices) by the day, multiple options to view content such as Connected Tvs, Smart Phones, Tablets, etc. and the growing popularity of this medium, even pirated film watching has come down significantly as per Industry estimates. I reckon that the Multiplex owners are facing one of the darkest times right now, with lower patronage to the screens coupled with external factors galore. By allowing film goers to bring their own food to the theatres, would occupancy levels increase? This move looks more positive for a few reasons – 1) it brings down the cost of watching family entertainers by more than half, thereby making the entire effort less expensive for families than before 2) it could drive a completely new set of the aspiring middle class audience, one that is looking forward to a world class (hic!) experience watching cinemas at Multiplexes but with the ability to offset food costs 3) This move would most importantly make the Multiplex Owners more conscious about how they price their products. I have said this before and I repeat – instead of selling 1,000 samosas a day at Rs. 50 a piece, they could sell 2,000 samosas at Rs. 25 a piece. This is just one example. And with lower food prices, volumes will certainly improve – this is the main reason theatre occupancy is much higher even today at standalone cinemas than at Multiplexes. While one has to put up with spicy masala odour at Cinemas, it is of great cheer and joy to watch a film with a full house audience. And with the core Indian mentality of “sharing & caring” we could see unknown families in neighbouring seats share food & sweets. A novel way to build Communal harmony, perhaps. Much needed right now in India. I plan to carry specially flavoured Idlis for the next outing. Anyone wishes to share some?